Located near the intersection of N. Jones Blvd. 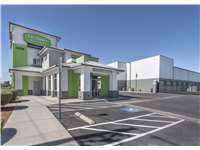 and W. Cheyenne Ave., Extra Space Storage serves Las Vegas residents near Summerlin and North Las Vegas. Locals will recognize our facility behind Wells Fargo Bank just north of Walgreen's. We're also accessible for residents of nearby apartments, such as Trellis Park at Cheyenne Apartments, Sonoma Palms, Rancho Park Apartments, and Northpointe Apartments. With a wide range of storage units, climate-controlled storage, vehicle storage, and more, Extra Space Storage on N. Jones Blvd. is the storage partner you can trust in Summerlin! Our Las Vegas storage facility has units as small 5x5 and as large as 15x40 with convenient features like indoor access, first-floor access, and drive-up access. We have the space you're looking for! I've had a great experience thus far at Extra Space. The facilities are extremely clean and easy to access, and there are carts available to help with unloading. The staff is very friendly and they were super detailed in providing me with information when I began my rental. Drive south on N Jones Blvd. Turn left onto N Rancho Dr. Turn right back onto N Jones Blvd. Our facility is on your right, just before W Cheyenne Ave.
Drive north on N Jones Blvd. Pass The Church of Jesus Christ of Latter-day Saints and continue straight on N Jones Blvd. Our facility is on your left, after W Cheyenne Ave and before W Miracosta Ave.
Drive west on W Cheyenne Ave. Pass North Las Vegas Airport and continue straight on W Cheyenne Ave. Turn right onto N Jones Blvd. Our facility is on your left, just beyond the Wells Fargo Bank. Drive east on W Gowan Rd and pass Dorothy Eisenberg Elementary School. Turn right onto N Jones Blvd. Our facility is on your right, just after W Miracosta Ave.